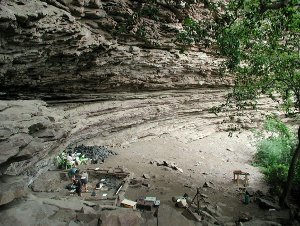 The KwaZulu-Natal Heritage Council is hoping to add the 40 000-year-old Sibudu Cave to the province’s list of heritage landmarks. Sibudu is an important Middle Stone Age site that lies on the banks of the Tongaat River, on the North Coast. Archaeologists have studied the cave for years, and several examples of early human technology have been found in it. “Not many South Africans know about Sibudu. Yet its significance has led to publications in journals and magazines like Science and The Economist,” said Crispin Hemson, chairman of the Durban branch of the Wildlife and Environment Society of Southern Africa. According to the KZN Heritage Council, also known as Amafa, Sibudu has to be protected from human encroachment before it can be proclaimed as a landmark. Amafa has set up a 200m radius zero development zone around the cave and is negotiating with several parties for this to be observed. The Qwabe Traditional Authority has agreed to steer clear of the development zone, but Amafa is still trying to lease or buy two private properties that fall within the 200m radius. Amafa has also hired a caretaker to monitor the site for any potential threats or problems. Sibudu was under threat from proposed housing and industrial development last year, but Amafa enforced alterations to the development plans so there would be no negative effect on the cave. “Sibudu is a very important archaeological site,” said James van Vuuren, the deputy director of Amafa. Sibudu has yielded a wealth of artefacts, such as one of the world’s oldest bone arrowheads, the earliest needle and the earliest example of the use of bedding.